For many western stillwaters, early to mid-summer is the time of the year that larger species of chironomids emerge. These pupae which are often in excess of 5/8 th’s of an inch in length regularly emerge from deeper water, sometimes as much as 40 feet in depth. These deep water emergences provide an abundant and safe food source for trout. It is also quite common for trout to feed on both larvae and pupae very close to the lake bottom. Such was the case last year when fishing one of my favourite Kamloops area lakes. A quick look at the waters edge revealed a major windrow of large pupal shucks, a very good sign of things to come. Once the boat was in the water we started slowly covering the lake in search of emerging and adult chironomids while at the same time monitoring my depth sounder. We soon observed pupa suspended in the surface film and adult chironomids sitting on the water that was 29 feet in depth. Almost immediately, fish markings, and some very large ones, began to appear on the sounder screen. There was not a continuous parade of fish crossing the sounder screen but enough to know that they were there and worth spending some time trying to catch them. The sounder also indicated the trout were consistently between 3 and 5 feet of the lake bottom. We chose to fish with strike indicators which would allow pupal patterns to be suspended at the depths the fish were appearing on the sounder. Needless to say, it was not a pretty site trying to cast out a 25 foot long leader plus indicator. However, a very open casting loop and slow casting stroke achieved the necessary results. A slight breeze provided just the right amount of movement to the flies as they slowly moved through the suspended fish. 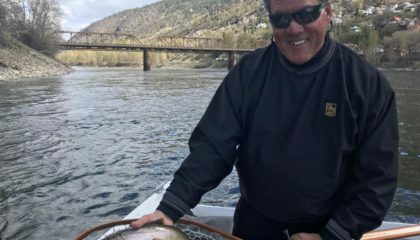 This technique worked well enough that day to fool three rainbows between 5 and 11 pounds. A good understanding of the chironomid life cycle and appropriate fishing techniques used in conjunction with a properly set up depth sounder were the keys to such a successful day on the water. Depth sounders or fish finders are very sophisticated electronics that can be a valuable aid for the angler in a multitude of fishing situations. One of the biggest challenges to successfully fishing stillwaters is understanding its underwater structure. 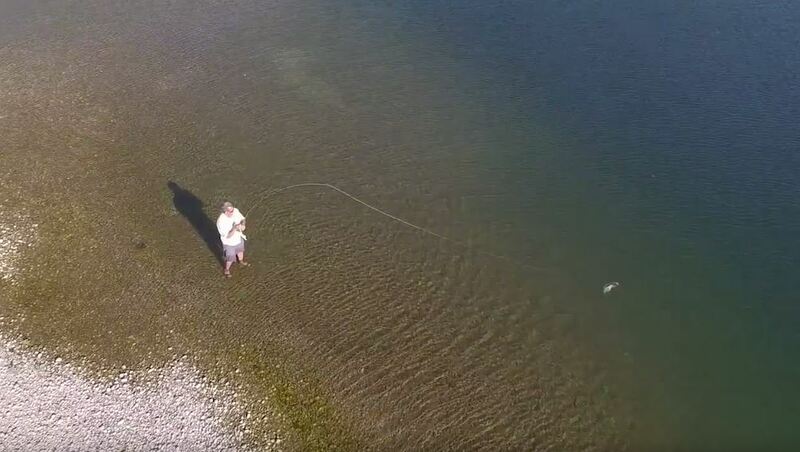 To many anglers, a lake appears as a deep featureless bowl. Knowing the “lay of the land” is fundamental in determining where and how to fish a lake. Littoral or shoal areas, drop-offs and deepwater zones of a lake correspond to the riffle, run and pool zones of a typical stream or river. Each of these 3 habitat types offer potential fish and fish food habitat at various times of the stillwater or stream season. Fish finders or depth sounders can accurately point out the key geographic features of a lake basin. This becomes particularly important when fishing murky or algal stained waters as shoals and drop-offs cannot be seen with the naked eye. Key physical features such as the depth and extent of shoals, transition zone of drop-offs, weed beds, sunken islands and even the texture of the lake bottom can all be viewed on the screen of a depth sounder. As their name implies, fish finders can also identify the presence of fish, mark their exact depth and give an indication of relative size or body mass. These units will also mark the extent of algal blooms and the depth where thermoclines become established. Thermoclines are narrow bands of water which are formed when an upper warmer layer of water meets a cooler layer of water. Thermoclines will often act as a barrier to mixing and can therefore affect the distribution of oxygen and the vertical migration patterns of zooplankton. Fish finders or depth sounders operate using the principals of sonar (SOund, NAvigation and Ranging) which was developed during World War II to track submarines. Sonar uses sound waves to determine the presence and location of underwater objects. A transmitter, transducer, receiver and a display panel make up a sonar unit. Basically, an electrical signal is sent from the transmitter to a transducer which converts the signal to a sound wave and sends it through the water. When the sound wave strikes an object the signal is rebounded or echoed back to the transducer. The transducer then converts the echo to an electronic signal which the receiver sends to a display or viewing screen. The time taken to send a signal and receive a return echo is used to determine the depth of the object. The transmitter sends many signals per second which results in the continuous recording of the bottom image of the lake. Other objects like fish, downed trees or weed beds will also send back signals and show up on the display screen. 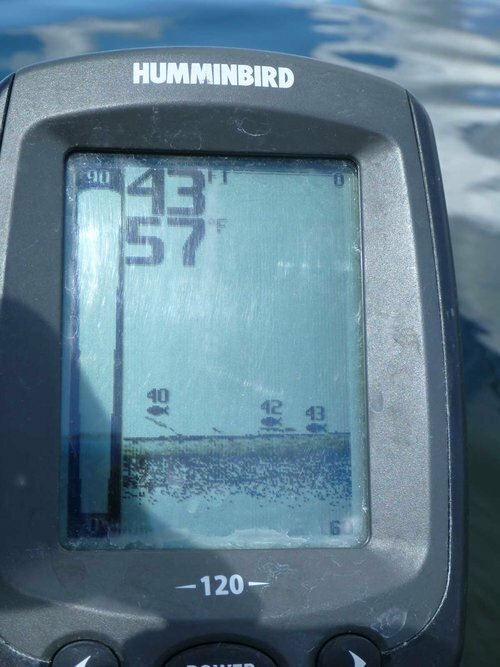 There are a number of variables that affect the amount and quality of information obtained from a fish finder. High frequency sonar signals (greater than 150kHz) have increased resolution but travel shorter distances in the water. Lower frequency signals have less signal resolution but can travel or receive impulses from a greater distance. The design of the transducer is also important in the effectiveness of a fish finder. The transducer emits a sound wave in a cone shaped beam. Wide cone angles produce a greater view of what is under your boat but at the expense of depth capability. Narrow cone angles such as those less than 15 degrees are more suited for salt water or deeper applications. As an example, a 90 degree transducer cone sending a signal through 25 feet of water will provide a 50 foot wide diameter area of coverage on the lake bottom. Numerous fish finder manufacturers offer models designed with multiple beam transducers in order to achieve the wide cone angles used for more specialized fishing situations. There are also fish finders designed with side scan or horizontally directed transducers. Some manufacturers offer a side scan transducer as an option thus allowing one to switch back and forth between the two transducers. This feature has good application to stillwater situations because again much of the fishing effort is in shallow water. There are also compact hand held sounder units available that provide a digital display of the depth. These flashlight sized units are perfect for packing into hike-in lakes or flying into remote fishing camps that may not be set up with more sophisticated fish finders. Most fish finders are designed for use in a hard hulled crafts such as fibreglass, wooden or aluminum boats. Transducers are designed for both permanent and portable installations. They can be mounted permanently to the inside hull of a boat or to the outside of the transom, fitted to an electric motor or temporarily attached to the transom of a boat with a rubber suction cup support. After market accessories including portable transducer brackets for boats and pontoon boats and float tube fish finder mounts are also available for most of the popular brands of fish finders. The key features to consider are frequency of the signal being sent and received and the transducer cone angle. Cone angles of between 50 and 150 degrees are ideal for stillwaters because the majority of the angling effort is done in water less than 30 feet deep. Present day fish finders are considerably more advanced than those available even 10 years ago. Many manufacturers offer the latest “side imaging” feature that definitely has applicability to trout lakes. As with most modern day electronics, the new depth sounders do a lot more than just tell you the depth. That means one must read and understand the operating manual to fully take advantage of it’s capabilities. A key function found on most fish finders is the sensitivity control. This regulates the ability of the unit to detect objects and create an echo signal. Sensitivity is affected by such things as water clarity, algal blooms and interference from other electronic devices. 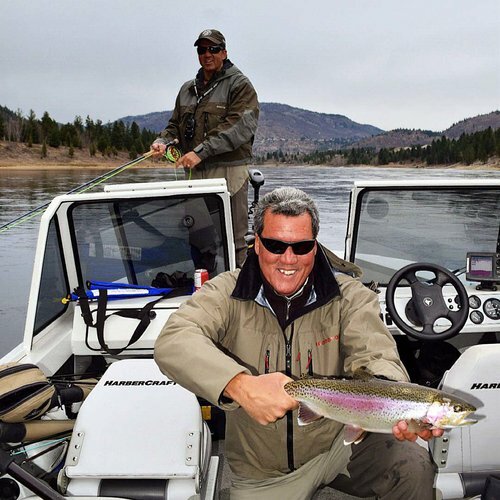 One of the best ways to learn about your sounder is to play with it on a clear water lake where trout or other fish can be seen swimming under or around your craft. These conditions will illustrate just how fine adjustments can be made in order to filter out the size of sonar markings such as small fish or suspended debris. Fish finders can be a very useful aid to the stillwater angler. 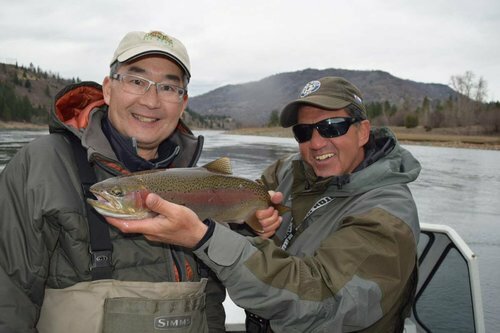 They can be invaluable when learning the underwater structure of a new lake and thus identifying the preferred habitat of trout or other game fish. A properly calibrated unit with the appropriately sized transducer can indicate the location and size of fish plus identify the depth to which algal blooms extend and outline the formation or absence of thermoclines. This “electronic” information can then supplement one’s understanding of prevailing food sources, emergence timing and fishing tactics.